We all need to worry. Whether your thoughts are more niggling – a comment you shouldn’t have made, or a looming deadline at work – to the bigger things, such as health concerns or being in debt, worrying is completely normal. To try to stop worrying is challenging, and in some cases can lead to even more worry; when your worries run away with you and become exaggerated it can spiral into anxiety and sometimes panic. This means our ‘what if?’ pattern of thinking can ensure we are not enjoying the present. It is easy to spend a lot of time in your head…analysing, thinking, problem solving, dwelling on the past, trying to predict the future, leading to unhelpful rumination and developing elaborate stories and outcomes, thus our thoughts become facts, no matter how irrational. Your mind can be so adept at believing these ‘facts’ that you can have a physical and emotional response to them. Imagining the worst, being convinced of rejection, and believing we will fail are all examples of how our interpretation of events can cause a knotted stomach, sweaty palms, increased heart rate and lightheadedness – sometimes spiralling into full blown panic – all simply in response to your thoughts. A quick way to help increase a sense of calm is to anchor yourself by directing your attention into the lower half of your body – beginning by focusing on your feet, how they feel, the connection to the ground. Then start to think about your lower legs, the sensations – heavy or light, cool or warm, relaxed or tense as you apply this attention to the upper legs and repeating. Finally, include the sensations of your breathing, relaxing as you breathe out. This ‘anchoring’ of where you are in the present moment can be done anywhere. Anchor yourself – then breathe…. 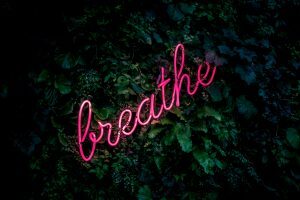 This technique helps by lengthening both the in-breath and the out-breath, ensuring you slow down your breathing, forcing you to release more carbon dioxide, thus slowing your heart rate and helping you to calm down. Starting with your in-breath – count up to 7 as you breathe in and then count to 11 as you breathe all the way out. Make sure you fit the numbers to your breath – if you need to find another ratio of numbers that work then that’s OK, just make sure the out-breath lasts longer than the in-breath. This is another grounding technique, that aims to slow breathing and reduce overwhelming feelings. Again, this is a time-friendly way to engage your senses and distract from worry. After relaxing into an upright position with your feet planted on the ground, place your hands on your thighs or desk. Breathe, nice and comfortably. Next, it’s time to engage your senses. What are 5 things you can see? Look around you and notice 5 things you hadn’t previously noticed – maybe a pattern on the wall, a source of light, or an object in the room. What are 4 things you can feel? Think about your feet and how they feel on the floor, the temperature of your body, the clothes you are wearing next to your skin. What are three things you can hear? Start to notice the noises around you that you hadn’t been aware of…a ticking clock, birds singing, cars on the street, any distant sound that connects you to it. What are 2 things you can smell? Try to pick up on any smells; coffee, perfume, flowers or anything relevant to your environment in that moment. What is the 1 thing you can taste? If you can, take a sip of tea or snack on something close to hand, taking notice of the taste and texture. You can choose more or less of each – this is just a guideline to get you connecting with your senses. It is best to practise these techniques whilst feeling calmer, so that you are able to confidently apply them when feeling more anxious.